After Surfing In Playa Hermosa | Your Hemp and CBD Resource! What’s better than surfing a full morning session in Playa Hermosa? 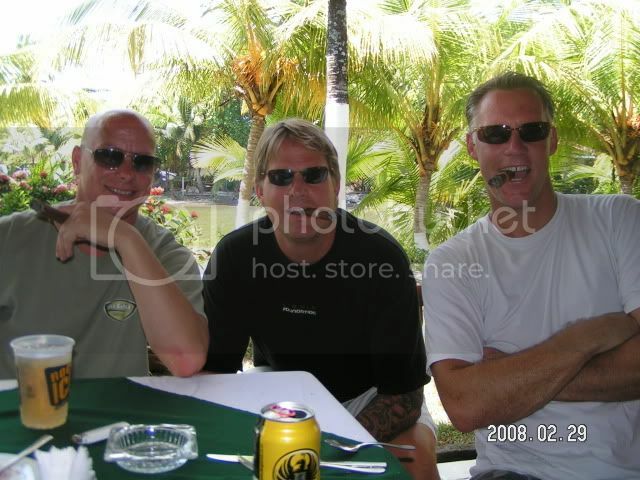 Then have a great lunch with a couple good friends at a hotel restaurant in Jaco. With ice cold Imperial beers and a Monte Cristo cigar, things couldn’t be more perfect! This is but one of many great memories I have in Costa Rica. Those two guys I’m sitting with are two of my best friends. The ruddy faced bald guy is Danno. He owns the world famous Caribbean bar and restaurant chain Danno’s Tiki Hut. He also happens to be my business partner in most of my financial pursuits. The guy on my right is Doc Wicks. He’s not really a doctor. But he’s an expert in finance and banking. He’s probably one of the coolest accountants I’ve known. He’s not at all as geeky as I thought him to be. He also just happens to hold the USC record for lowest body fat ever by an athlete. He’s such a fitness freak! Our table is about 100m from the ocean, and that river behind us empties into the ocean. I saw some kids swimming in it and thought for sure they were going to get eaten by alligators. But that’s another story.